A paver patio is a particular kind of patio that uses interlocking stones that can be laid down in a variety of patterns and using varied shapes, sizes, and colors to create a unique look that no one else may have! Here are a few benefits to installing one in your backyard. Paver patios are incredibly versatile thanks to being created with stones rather than just boring concrete or any other singular material. You’ll be able to put your own detail and design into it by deciding on the look of the stones and how they’ll be patterned. If you have a taste for putting your own special touch on your home, this is a fantastic choice. It also makes it easy to suit it to the overall look and theme of your home. Your new patio will be the perfect place to host outdoor get togethers for friends and family! It gives you a flat surface to decorate as you choose with tables and chairs, grills, and anything else you might need to make a spectacular party. The adults can relax barefooted with drinks and music while the kids are free to play without getting too dirty. It also makes it easy to move furniture around depending on the needs of the party, rather than have to drag anything through grass and otherwise. If you prefer a quiet night to yourself enjoying the outdoors or with a special loved one, your patio will be the perfect spot to curl up by a fire pit and talk, read a book, or whatever else will help you rest after a long day. Whether you want to make a lovely dinner, or simply enjoy the stars, it’s the ideal spot for either. 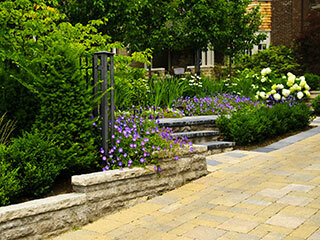 Should you decide that a paver patio sounds perfect for you, there won’t be weeks of waiting for it to be completed! Rather than building a whole deck or otherwise, it will only take a few days for your new patio’s stones to be put down into place.